This is the 20" x 14" "Eagle Hunter" PaintWorks Paint-by-Number Kit from Dimensions. Suitable for Ages 10 & Older. Retail $19.50 SAVE 23% ! Very satisfied great product and good delivery time. Design is preprinted on a canvas artboard, and comes with separate numbered practice guide. High quality, quick-drying, non-toxic acrylic paints. Instructions, helpful hints and techniques provided. They made this one right. The fog was made to be mostly a single color which translates well into paint by numbers. 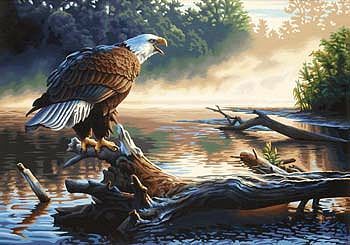 Most of the detail is taken up by the eagle, the water, and the small log which makes the painting look much better as you look at these things the most. The water is very impressionist, which I like... a lot. This picture is stunning once finished. the colors give it a great since of depth & perspective. The foggy area effect is easy to create by using almost a circular effect.